In a large pan heat a couple of tablespoons of coconut oil then add the onion and pepper and cook for bout 5 minutes over a medium heat. Add the chilli, garlic and ginger with a good pinch of salt and stir to cook the spices out until fragrant, taking care not to burn the garlic as over-cooking will make it taste bitter. Add the ground turmeric, stir well then add the coconut milk and water. Add the rinsed lentils with a stock cube along with the keffir lime leaves, cherry tomatoes and about a quarter of a teaspoon of ground black pepper. Bring to the boil then simmer for about 20 minutes. Check the seasoning, adding more salt and pepper if necessary. Meanwhile roast the defrosted coconut flesh on a baking tray in an oven at about 180C until the coconut starts to turn a golden/grown colour around the edges. 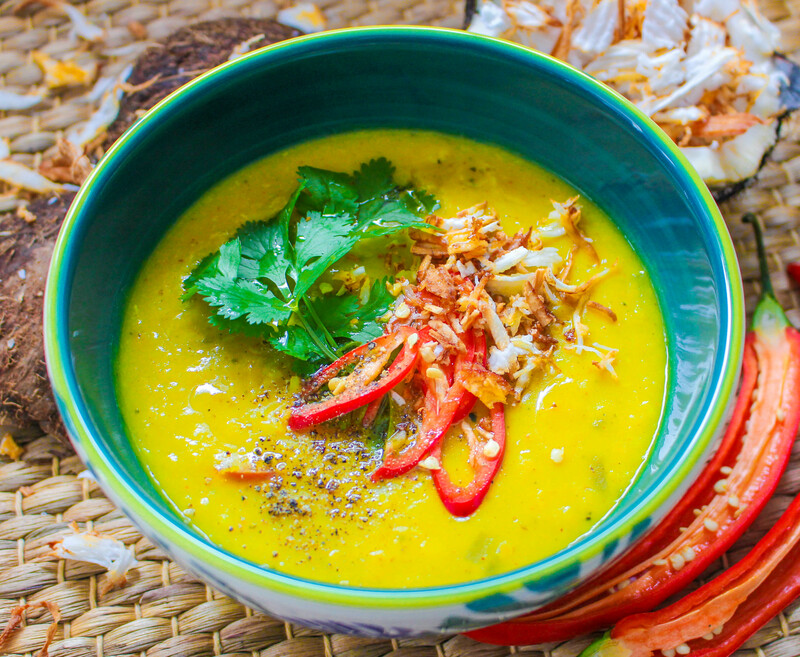 To serve the soup, ladle into warm bowls then top with some grated coconut, fresh coriander and some more chilli. Enjoy!